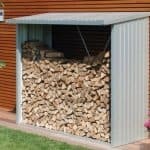 More and more people are switching to logs and firewood to heat their homes and create their energy. It’s great for the environment, of course, and it can also save money on household bills. A large house, however, can call for a large amount of logs, and that’s when this large walled log store can come in very handy indeed. 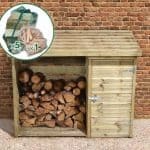 It’s among the tallest log stores that we’ve reviewed, and this brings obvious benefits in the amount of logs and timber that can be stored. Stability certainly won’t be an issue, because it’s designed to be affixed directly to a wall, and it is also floor free so can be constructed directly onto a level area of concrete or patio. We were glad to see that all fixtures and fittings are included, and that the assembly instructions are very straightforward. The roof of this log store, and with the addition of an open front it means that lots of air can circulate around the logs. This encourages them to dry out very quickly, so they’ll burn more freely and for longer when in use. The timbers that make up the roof and side have all been pressure treated, giving them a lasting and reliable defence against rot. This has a rather unique design among the log stores we review in that it’s neither attached to a timber shed nor designed to stand alone. 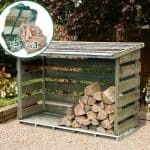 With a pitched and slatted roof and two solid sides it is economical in the timber it uses, and yet it still offers a very good storage capacity. It has to be attached to a solid wall, and by choosing the wall carefully you can also give it added weather protection while still exposing the logs to much needed ventilation. The tallness of the log store is shown by the ridge height of 1.95m, and it has an eaves height at the front of 1.61m demonstrating the pitched nature of the roof. Although no base is included, the overall width is 1.75m and the overall width is 0.60m. In most log stores we review the thickness of the cladding is all important as it’s this that gives it stability during windy conditions. In this case, however, that aspect becomes less important as the wall to which it’s secured gives more than ample stability. That’s why the roof thickness of 10mm and the wall thickness of 10mm, which is significantly less than some we see, is still adequate. In fact, we have little doubt that the solid sheet material will stand up well to the everyday knocks that a log store can endure. As well as a back being missing, for obvious reasons, there is also no floor on this store. That’s because once it’s secured to the wall it can stand upon any flat surface such as concrete. This, however, exposes the logs at the bottom of the pile to ground moisture which can quickly result in rot. 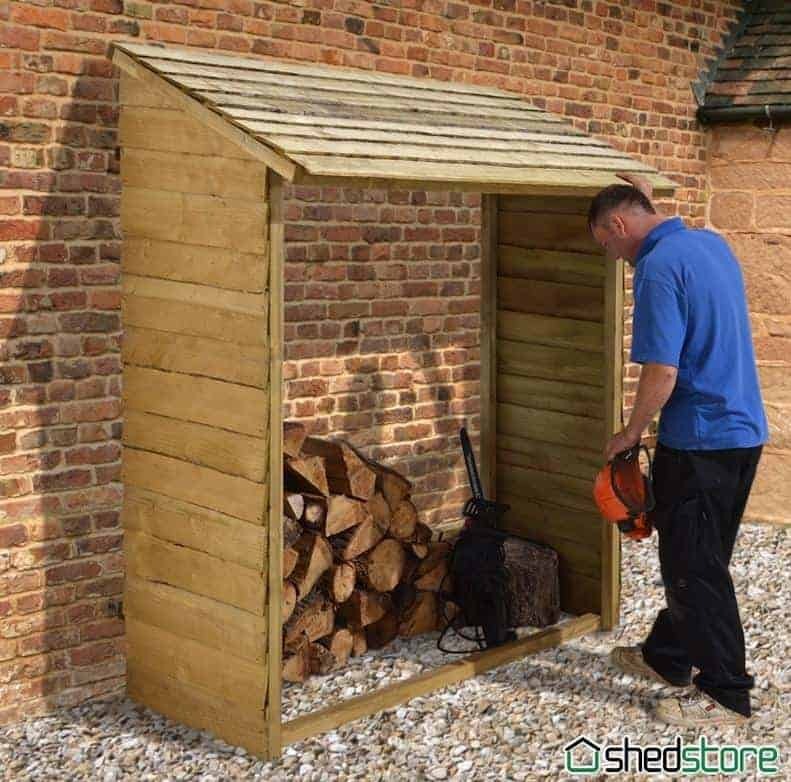 The assembly instructions state that sliced logs or bearers can be used to keep the other contents elevated above the ground, but we would prefer a base to have provided to carry out this important function. Although this log store has solid sides, protecting the contents from rain driving in from those directions, there is an open face and a slatted roof. These provide the air flow that logs need in order to be ready to burn, as well as the open front making it easy to load and unload logs, but it also means that they can be exposed to the elements. By affixing the store to a wall that will itself provide protection, possibly one in the shadow of an overhang, this potential problem can be negated. We were pleased to see that all timbers used in this log store had gone through a pressure treatment process. This means that wood preserver is forced deep down into the wood itself rather than sitting on the surface, which gives it long lasting protection from the threat of rot. That’s why the manufacturer has been able to give a 15 year warranty against this eventuality, which is as long as any that we see. It also means that there is no onus on the customer to add their own wood preserver treatments, although we still recommend inspecting the wood yearly. One treatment that we think is worthwhile is adding a coat or two of exterior grade paint, as this will prevent fading and keep the log store looking good for years to come. Thanks to its unique fixed nature, the versatility of this log store is slightly compromised. 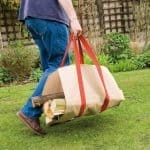 By this, we mean that it can’t be moved to different locations around the garden to act as a toll store, for example, or a place to hold bags of soil or compost. 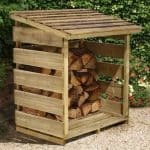 For its main function as a log store, however, it performs very well. It was good to see that pressure treatment had been used on all the timbers, even though they weren’t the thickest we’ve seen. The fact that this structure has to be secured to a wall gives it extra stability and weather protection, making it even more durable. This is backed up by the inclusion of a 15 year warranty against rot. Even though this is one of the shallowest log stores that we’ve seen, it’s also one of the tallest. That means that it has a very accommodating overall log capacity. The instructions take up two sides of paper, and are very easy to follow. All the fittings are included, including four wall plugs, so you should be able to install this in around two hours. 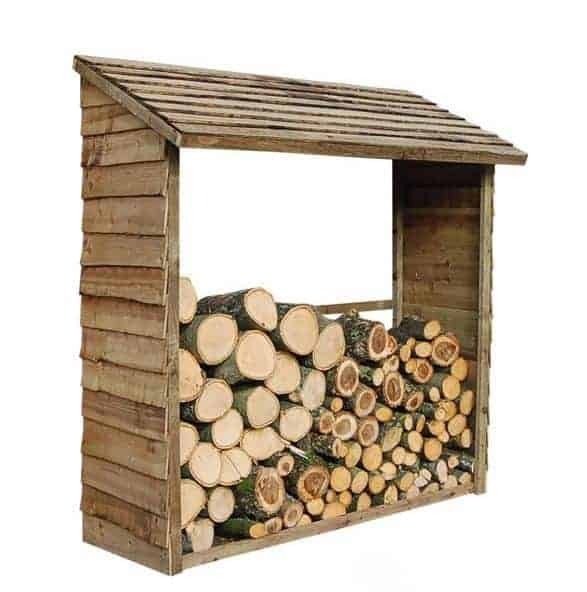 We’ve reviewed log stores which are slightly cheaper than this, but even at over a hundred pounds we feel that this represents good value for money considering its size. 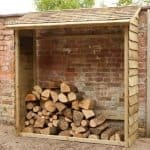 Final Thoughts: Once in place, this log store is a permanent fixture, so we were pleased to see that it has such a traditional and attractive appearance. This can be further enhanced through the use of a wood stain or garden paint, which is something that we’d recommend. The only negative point about this store is that it doesn’t include a base that can lift the logs above the moisture rich ground level, but this can easily be improvised. Other than this, we feel that this is a well constructed log store, and one that should last a long time thanks to the pressure treatment applied to the timbers.